*Corresponding Author: Aiman Rahmani, Pediatrics Department, Tawam Hospital in affiliation with Johns Hopkins Medicine and College of Medicine & Health Sciences, UAE University, United Arab Emirates. Objective: To assess maternal and neonatal outcomes in women with Gestational Diabetes Mellitus (GDM) treated with Medical Nutrition Therapy (MNT) plus insulin and patients treated with MNT alone. Method: A retrospective analysis of pre-specified maternal outcomes for two hundred GDM patients; 44 treated with MNT plus insulin and 156 treated with MNT alone. In addition, 200 neonates of same patients were evaluated for selected neonatal outcomes. Results: Pregnant women treated with MNT plus insulin had a higher baseline BMI, parity, and blood glucose levels during the OGTT’s. They had longer hospital admissions during pregnancy and delivery. Maternal complications in this group were higher for preeclampsia but there were lower rates of polyhydramnios and perineal tears. The overall incidence of neonatal complications was significantly lower in neonates born to mothers in the MNT plus insulin group when compared to the MNT only group (7.9% VS 21.4% respectively, P value < 0.05). Neonates born to mothers treated with MNT plus insulin had significantly less macrosomia (5.3% VS 8.4%, P < 0.05) and less neonatal hypoglycemia (2.6% VS 13.0%, P < 0.05). Conclusions: Glucose lowering by adding insulin in women with GDM is superior to MNT alone. Stringent blood glucose monitoring with prompt insulin initiation is associated with improved maternal and neonatal outcomes in our GDM patients. Very high prevalence of GDM in UAE with high baseline risk (BMI and parity). Poor compliance with diet, glucose monitoring and regular follow-ups. Physicians and patients are reluctant to start insulin. Gestational diabetes mellitus (GDM) is a global health concern as it affects the wellbeing of mother, developing fetus and the neonate. The prevalence in the USA is approximately 3-5% of pregnancies , whereas in the UAE it is a very common condition affecting up to 25% of all pregnancies . Fetal hyperinsulinemia to counter maternal hyperglycemia results in excessive growth of the fetus, leading to macrosomia and birth trauma. GDM is associated with neonatal hypoglycemia, hyperbilirubinemia, polycythemia and hypocalcemia. In the mother, GDM is associated with increased rates of caesarean delivery, polyhydrominous, preterm delivery and pre-eclampsia. Recent research in Epigenetics and the Developmental Origins of Health and Disease (DOHaD) demonstrate that many adult chronic diseases; including GDM; contribute to intrauterine fetal programing and hence, to the outcome in childhood especially between conception and 2 years of age [3-6]. Timely diagnosis and treatment of GDM are critical to improve both maternal and neonatal outcomes . Coordinated multidisciplinary team approach to the management of gestational diabetes was proven to be effective in reducing maternal and fetal complications in comparison to fragmented services . The management of GDM has significantly advanced in the past two decades; new insulin therapies became available and patients' self-monitoring of blood glucose was widely incorporated in care plans. A stepwise approach is the best way to treat GDM, beginning with individualized medical nutrition therapy (MNT) and exercise program and proceeding to pharmacological interventions if failure occurs. However, there is no clear guidance on when to initiate insulin in patients treated with MNT alone. In addition, the effectiveness of adding insulin to has not been previously evaluated in our practice. All pregnant women undergo screening with the 2-hour 75 g Oral Glucose Tolerance Test (OGTT) during the first visit to the obstetrician. Normal OGTT’s are repeated at 24-28 weeks of pregnancy. Women with abnormal results are referred to the “GDM Program” where full nutritional and diabetes education counseling are granted. Patients with special needs are referred to have individual sessions. Pregnant women are then followed regularly every 2-4 weeks by the obstetrician and diabetes educator to review their records of Self- Monitoring of Blood Glucose (SMBG). Whenever not achieving the specified targets of fasting blood glucose of 5.3 mmol/L or 2-hour postprandial of 7.8 mmol/L, patients are referred to the endocrinologists to start insulin. While on insulin, more stringent glucose targets of less than 5 mmol/L while fasting and 2-hour post prandial glucose of less than 7.2 mmol/L are applied. Patients on insulin are followed more frequently and have an easy access to the providers in the center. Non-stress test and ultrasonography are routinely performed after week 36 during each visit to estimate the fetal wellbeing, growth and weight. The route of delivery is individually decided according to the metabolic control, obstetric condition, and to patient or obstetrician preference. In this study we reanalyzed the data from our previous study in which we evaluated the effectiveness of a multidisciplinary approach in the management of GDM . Here we evaluate for maternal and neonatal outcomes according to the type of GDM treatment. We randomly selected five percent out of 3892 Emirati women whom were diagnosed, regularly followed in our combined obstetrics endocrine clinic and delivered at our institution from October 2011 to September 2012. Two hundred 200 women with GDM, 44 treated with diet plus insulin and 156 treated with diet alone, were fully reviewed. As mentioned above, all subjects received nutritional and diabetes education counseling. Diet for gestational diabetes was defined as medical nutrition therapy (MNT) for gestational diabetes that promotes nutrition for maternal and fetal health with adequate energy levels for appropriate gestational weight gain, achievement and maintenance of normoglycemia, and absence of ketones. Diet plan is individualized and is developed by the certified nutritionist and her patient. In addition, 200 neonates born to same mothers were assessed for pre-specified neonatal outcome indicators. The data was saved in MS Excel 2010 and then uploaded to IBM SPSS (Version 22.0, IBM Corporation New York 10504-1722). Homogeneity of the variants between the variables was done using the Levene test of equality of error variances which shows no significant variance within the groups of variants with regards to diabetes management, and macrosomia, while the equality of error was significant for the neonatal complications, hypoglycemia. Pearson’ chi square test was used to evaluate the difference in each dependent variable between the two groups including the occurrence of macrosomia, hypoglycemia. Mothers treated with diet plus insulin had a significantly higher baseline risk in regards to BMI, parity, and blood glucose levels during OGTT’s. In addition, they had significantly longer periods of admissions during pregnancy and delivery. There was a significant difference in the documentation of self-monitoring of blood glucose (SMBG) between the two groups; Mothers treated with diet alone had significantly lower documented readings (65.9% VS 91.6% respectively, P < 0.05) (Table 1). Pregnant ladies in the diet plus insulin group had increased rates of preeclampsia but lower rates of polyhydrominous and perineal tears. 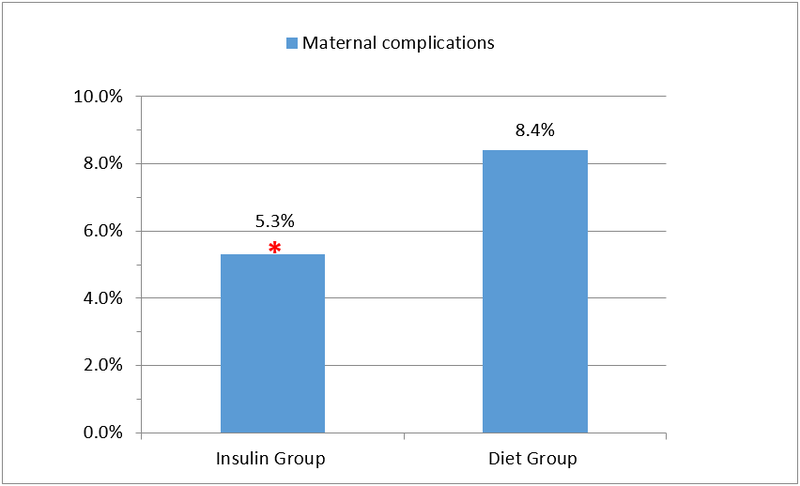 Overall, mothers treated with diet plus insulin had significantly less complications than mothers treated with diet alone (5.3% VS 8.4% respectively, P < 0.05) (Table 2, and Figure 1). Figure 1: Incidence of maternal complications. 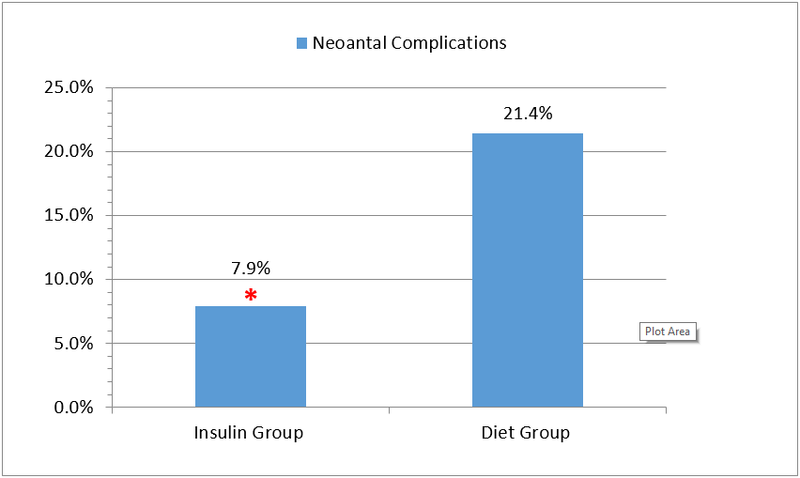 Finally, the overall incidence of neonatal complications was significantly lower in neonates born to mothers in the diet plus insulin group when compared to the diet only group (7.9% VS 21.4% respectively, P value < 0.05) (Figure 2). Neonates born to mothers treated with diet plus insulin had less macrosomia (5.3% VS 8.4%, P < 0.05) and less neonatal hypoglycemia (2.6% VS 13.0%, P < 0.05) (Table 2). Figure 2: Incidence of neonatal complications. The importance of management for women with gestational diabetes has been widely supported [9-11]. Treating even mild cases of GDM been shown to reduce the risks of fetal overgrowth, shoulder dystocia and pre-eclampsia . However, the cutoff diagnostic glucose values for gestational diabetes remain contentious among an array of available recommendations from different international authorities (WHO, ADA, IADPSG, Canadian Diabetes Association) . The other important controversy is the cutoff values for initiating insulin therapy in patients with GDM. Recent evidence demonstrated that early treatment with insulin is of benefit in the reduction of macrosomia in this high-risk group . Management of GDM includes lifestyle modification and medical nutritional therapy as the cornerstones in the treatment [15,16]. Blood glucose monitoring is recommended in all patients in order to evaluate blood glucose levels and tailor treatment; in addition, it provides the woman with feedback on her management progress. Insulin is considered the gold standard therapy for GDM and is indicated when blood glucose targets are not achieved by diet and exercise. There is no clear guidance on when to add insulin to patients with GDM. An audit of our practice showed that 25-30% of our GDM patients are managed by adding insulin to their lifestyle modifications when failing to achieve preset targets of 5.3 mmol/L or 7.8 mmol/L for fasting and 2-hour postprandial, respectively. In the current study, the 44 patients in whom insulin was added to their diet had significantly higher baseline BMI, parity, and blood glucose levels during OGTT’s, all of which indicate higher baseline risks and predict worse outcomes in this group. Many factors might have contributed to the overall better maternal and neonatal outcomes in the insulin plus diet group including timing of referral, providers’ preferences, and patients’ related factors. Patients in the diet only group are typically followed by obstetricians and diabetes educators, more likely to be less compliant with their diet, monitor and document their blood glucose less frequently and are subjected to unrecorded spikes in their blood glucose. Physicians and patients in this group might be reluctant to initiate insulin and are more likely to accept higher blood glucose levels. On the other hand, patients treated with diet plus insulin are followed by endocrinologists and diabetes educators, had more frequent visits to the clinic, are more likely to be compliant with their diet, and monitor their blood glucose more often (91.6% vs. 65.9% in the diet only group, P < 0.05). Blood glucose spikes in this group are more likely to be captured and therefore managed promptly. As expected, better glycemic control in the diet plus insulin group during pregnancy and during delivery are respectively associated with significantly lower rates of macrosomia and neonatal hypoglycemia. In conclusion, our study shows that glucose lowering by adding insulin to diet in women with GDM is superior to diet alone in our high risk population. Stringent blood glucose monitoring and early insulin initiation are indicated to improve maternal and neonatal outcomes. Acknowledgments: Authors are in debt to Seham El-Khamdi, Lina Majd, Sana Roubi Hosn Saif Eddine and Khaldoun Delki for their valuable contribution to Tawam GDM Service and for data collection. "This research received no specific grant from any funding agency in the public, commercial or not-for-profit sectors?. “The authors have no competing interests to declare”. Klein J, Charach R, Sheiner E. (2015). Treating diabetes during pregnancy. Expert Opin. Pharmacother. 16 (3):357-68. Agarwal MM, Dhatt GS, Punnose J, Koster G. (2005). Gestational diabetes: dilemma caused by multiple international diagnostic criteria. Diabet Med. 22(12):1731-6. Seabrook JA, Woods N, Clark A, de Vrijer B, Penava D, Gilliland J. (2018). The association between alcohol outlet accessibility and adverse birth outcomes: A retrospective cohort study. Journal of Neonatal-Perinatal Medicine. 11(1):71-7. Barker DJ. (2012). Developmental origins of chronic disease. Public Health. 126 (3):185-9. Gluckman PD, Hanson M, Cooper C, Thornburg KL. (2008). Effect of in utero and early-life conditions on adult health and disease. N Engl J Med. 359 (1):61-73. Winett LB, Wulf AB, Wallack L. (2016). Framing strategies to avoid mother-blame in communicating the origins of chronic disease. Am J Public Health. 106 (8):1369-73. Crowther CA, Hiller JE, Moss JR, McPhee AJ, Jeffries WS, Robinson JS. (2005). Effect of treatment of gestational diabetes on pregnancy outcomes. New England Journal of Medicine. 352 (24):2477–86. Rahmani A, Afandi B. (2015). Improving neonatal complications with a structured multidisciplinary approach to gestational diabetes mellitus management. J Neonatal Perinatal Med. 8 (4): 359-62. Alwan N, Tuffnell DJ, West J. (2009). Treatments for gestational diabetes. Cochrane Database of Systematic Reviews. Boulvain M, Stan C, Irion O. (2001). Elective delivery in diabetic pregnant women. Cochrane Database of Systematic Reviews, Issue 2. Ceysens G, Rouiller D, Boulvain M. (2006). Exercise for diabetic pregnant women. Cochrane Database of Systematic Reviews Issue 3. Landon MB, Spong CY, Thom E, Carpenter MW, Ramin SM, Casey B, et al. (2009) A multicenter, randomized trial of treatment for mild gestational diabetes. New England Journal of Medicine. 361(14):1339–48. Agarwal, MM, Shah, SM, Al Kaabi, J, Saquib, S, and Othman. (2015). Gestational diabetes mellitus: Confusion among medical doctors caused by multiple international criteria. J Obstet Gynaecol Res. 41(6), 861–869. Maher N, McAuliffe F, Foley M. (2013). The benefit of early treatment without rescreening in women with a history of gestational diabetes. J Matern Fetal Neonatal Med. 26(3):318-20. Hoffman L, Nolan C, Wilson JD, Oats JJ, Simmons D. (1998). Gestational diabetes mellitus--management guidelines. The Australasian Diabetes in Pregnancy Society. Med J Aust. Jul 20; 169 (2): 93-7. Citation: Bachar Afandi, Juma Al Kaabi, Al Mutaz Mohamed Abdalla and Aiman Rahmani. (2019). Insulin Improves Maternal and Neonatal Outcomes in Emirati Women with Gestational Diabetes Mellitus. Archives of Endocrinology and Diabetes 1(1). Copyright: © 2019 Bachar Afandi and Aiman Rahmani. This is an open-access article distributed under the terms of the Creative Commons Attribution License, which permits unrestricted use, distribution, and reproduction in any medium, provided the original author and source are credited.